Hematite is a shiny black stone which is technically not a crystal – it’s actually a mineral (iron oxide). It is a root chakra stone which will ground and centre you, enhance your concentration and mental clarity, and boost your will-power and confidence. Hematite is one of the most powerful grounding stones. It also has a calming effects and can soothe frazzled nerves. Because of this, it can help you improve your concentration and aid you in decision-making. It has the effect of clearing the clutter in your mind and your energy field. Its energy is powerful and highly protective against negativity. The root chakra is the chakra that connects us to the physical and grounds stabilises us. A weak root chakra can make a person feel scattered and fearful. 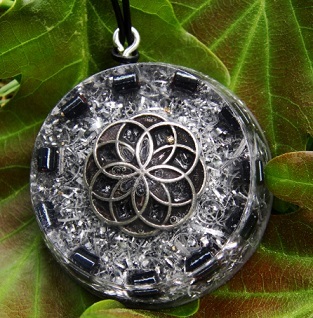 A hematite orgonite pendant will help ground you and connect you to the physical. It will stabilise you, and has the added effect of improving your self-esteem. 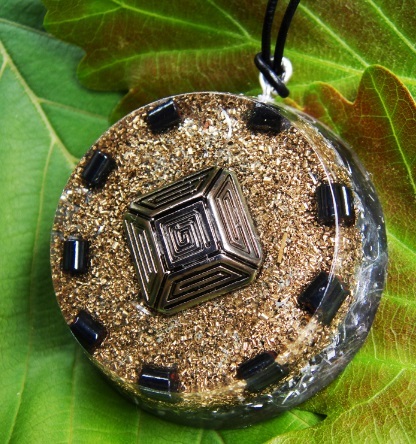 Hematite orgonite pendants can prove a powerful tool for healers and empaths that tend to take on other people’s energy easily. All healers and empaths should take care that their root chakra is strong so that they can feel grounded and connected to their physical self even when they are being bombarded with other people’s energy. 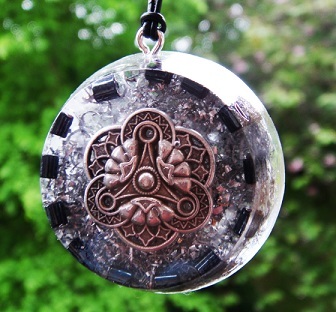 Not only does hematite orgonite ground and protect you, it also deflects negative energy. If you want to buy a hematite orgonite pendant, including the ones pictured on this page, head over to the hematite orgonite section on the Orgonise Yourself Store. I love your site! Do you have an instagram account? !